Achievements are so much better when people earn them. Whether it’s a first car, a college education or that big move away from home, we all have dreams about what it will be like to reach life’s milestones. Originally a barber shop, the theater at 4721 wasn’t exactly ready to host shows when first discovered by Torch. Chairs, hair under the floorboards and no walls meant it would need to be renovated before it could be zoned by the city for assembly. According to board member Nina Miller, Torch took great care in working with the city to make sure everything was done by the book. Because their budget was extremely limited, any wasted work could delay opening for weeks or months. 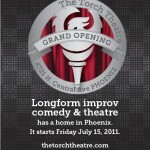 Founded in 2007, Torch’s original goal wasn’t to open its own theater, but to establish a community around long-form improv. Once they assimilated a rag-tag troupe of artists, their focus shifted. According to Miller, the group’s sentiment revolved around one observation. Thanks to their original, temporary home at Space 55, Torch was able to scrimp, save and raise enough money to head out on their own. Now that they’ve opened, founding member Mack Duncan promises more of the same great shows they’ve put on for years, in one place with renewed focus. “[We want to] take this art form as far as we can take it,” Duncan said. While the first three weekends have been a success, Torch isn’t resting on their laurels encouraging community involvement. Because their space is so intimate, it’s impossible for anyone to attend and not have some impact on the show, whether with their very presence or, like me, the loud laughter often following a joke. Some people, like ShanMan during their opening weekend and yours truly the weekend after, were part of the experience. Every Saturday night Torch presents the Neighborhood, which consists of one person telling one story at a time–on stage–each based on an audience suggestion. 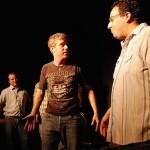 Torch uses the material for three to five sketches and then the monologist hops back on stage for another story, which is followed by more sketches. For many of the monologists, this experience marks their first time as part of an acting troupe, an experience that’s as frightening as it is awesome. Anyone who’s ad libbed a speech will appreciate the rush. If you’ve ever rambled on in hope that your thoughts will eventually come together into some point or punchline, you get the idea. Picture doing that with lights in your face, experienced actors behind you and an audience that desperately wants you to succeed. It felt like being thrown into water without any real fear of drowning, as the first half of my stories were random words as my mind desperately searched for focus. When’s the last time YOU ever saw a performance where someone from the audience set up nearly every scene? Most people haven’t, and that’s what makes Torch special. It’s an improv troupe in a theater ad libbing their way through life and touching other’s lives while doing it. Performances are every Friday and Saturday at 7, 8:30 and 10:30 pm.